The darkest hour before dawn. Along the front of 450 miles, on both sides of the line, men left the fug of their crowded dugouts, stood shivering in the darkness and waited, weapons ready, for an attack across the foul, frozen, wastes of no-mans-land by those soldiers opposite. In turn, those opposite waited for a similar attack. They had all done this every morning since the early days of the war in 1914 when the fighting and the front lines changed from a war of movement into static warfare. There were not many of the old originals left; those who remained in the trenches were often aging veterans in their twenties. A few had been promoted to senior positions that removed them from the actual front lines. A large number had been discharged from the army as being no further use due to debilitating wounds, (which often meant that they were unemployable in civilian life and condemned to a life of penury). Some had been patched up and 'returned to service'. As 1918 dawned, the German military faced a Good News / Bad News scenario. The Good: Russia had been knocked out of the war, Italy was down and almost out after Caporetto, and in the west, after 1917's failed Nivelle Offensive and ensuing disorder, and the grinding down of Passchendaele, the British and French armies were no threat to retake the occupied areas of northern France and Flanders. The Bad: the people of Germany were beginning to suffer mightily from the naval blockade and the costs of waging total war. Unrestricted submarine warfare had not brought the expected decisive results, and, ominously, American troops were about to start arriving in huge and accelerating numbers. The Hindenburg-Ludendorff solution: force the British and French to settle on terms advantageous to Germany -- before the Americans arrived in strength. From March through July, the German Army, using the million additional men now no longer needed in the east, mounted a major offensive each month. In 2008, Tony Noyes will be telling us about the planning and execution of each of these operations, known by many names, but which we will call the "Ludendorff Offensives". Then in midyear, just as the tide of battle turned in July 1918, Tony will describe, step-by-step, the series of Allied "Victory" offensives culminating in the November armistice. Manpower in all the armies was a continuing problem with the need for men far outweighing the numbers still available. Women had taken over many of the men's jobs, often taking positions that had always been a male preserve. The men called for service were getting younger, and their army training was shorter and sometimes perfunctory. The man in the trench, wrapped up in any garments that kept out the penetrating cold stared out into the dark, stamping his feet to get some warmth into them. As the dim winter sun began to light the skyline, he saw the same sights as yesterday and many days before. He saw the old skeleton still dressed in its mouldering uniform from many days past. He heard the rattle of the tin cans hanging on the wire to give warning of incoming fighting patrols, he heard and saw the gigantic rats exploring in their constant search for food. He didn't notice the appalling smell of his surroundings which was, by now, a way of life. He became aware of his compatriots beside him, staring into the lightening darkness, and doubtless thinking, as he was, of a brew-up and, with luck, breakfast. 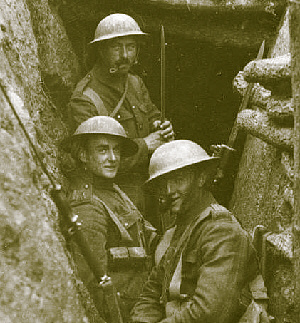 All the while, he hoped that the enemy would not see the smoke from the cooking and launch a salvo of mortar bombs into the trench to destroy his few minutes of peace before the business of the day began: the interminable job of maintenance on the maze of trenches and wire which, with acceptance of wounds and death, was his world. He could not envisage any other. Was there really a world of warmth, laughter and a woman's company existing somewhere else? The year of 1918 did not start with any possibility of hope for an end to this purgatory. Last month I gave the readers a strong BUY! signal on the reissue of Sewell Tyng's classic battle study The Campaign of the Marne. Since then --I guess because most of you know I also lead annual tours of the Western Front battlefields --I've received inquiries about visiting the sites described in Tyng's work. This is a considerable challenge because the 1914 battle was fought along a front over 120 miles long, extending from north of Paris to St. Mihiel in the east. In the past I've recommended two guidebooks to readers, Before Endeavors Fade by Rose Coombs, which is strongest on the British and Commonwealth sites, and the American Battle Monuments Commission publication American Armies and Battlefields in Europe. Neither of these, though, are particularly good on the First Battle of the Marne, in which the BEF played a rather small (but important) role and the AEF played none. The Battle of Loos in September 1915 was one of the meaningless, supposedly strategic battles fought in 1915. 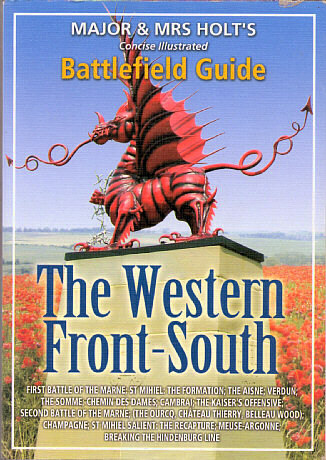 With the disaster of the Dardanelles campaign and the Russian defeats in Galicia and Poland, it was determined that there should be a major combined Anglo-French offensive on the Western Front. The French would concentrate on the Champagne sector and the British on the area of Artois. The Allied powers had an advantage in the number of men; the Germans had the advantage of a strengthened defense with large numbers of machine guns and superior numbers of artillery, mortars, grenades and ammunition. The British used poison gas for the first time. Unfortunately the chlorine gas released drifted back to the British lines and caused casualties among their own troops. Starting on September 25th, the battle lasted with limited gains until October 14th. The slaughter among the British was so great that the Germans called the battle "Leichenfeld (Field of Corpses) of Loos." The British suffered 60,000 casualties in the Battle of Loos. After the battle Sir John French was sacked, and three months later in December 1915 Sir Douglas Haig became Commander in Chief. With the outbreak of World War One, the male youth of Britain inflamed with patriotism, propaganda and the fear of civil ostracism hastened to enlist in the armed services of the Empire. My Boy Jack recounts how John Kipling, (known as Jack) Rudyard Kipling's son, tried to enlist but was rejected due to his poor eyesight. Extremely nearsighted, Jack couldn't read the top line of the eye chart without his spectacles until he was three feet away from the chart. However, his father determined that his son would serve and used his personal influence with an aged Lord Roberts, the commanding officer, to get Jack a commission in the famed Irish Guards. Jack overcomes his physical weakness to become a true leader of men. However, he dies in the Battle of Loos and Kipling finds he must confront his conflicted emotions between his love of family and his love and devotion to King and Country. Directed by Brian Kirk with a screenplay by Daniel Haig, who also plays Rudyard Kipling, My Boy Jack also stars Kim Cattrall as Kipling's wife Caroline and Carey Mulligan as Elsie Kipling, Jack's sister. Jack is played by Daniel Radcliffe. This is an exceptionally powerful drama, superbly acted and extremely moving. The tension within the Kipling family caused by Jack's commission, his fate and their reactions has emotional overtones that are heightened by today's political events. My Boy Jackwas aired in the U.K. on November 11, 2007, Remembrance Day, and has been released on DVD in the U.K. The DVD includes deleted scenes and insightful interviews with Daniel Radcliffe, David Haig and Kim Cattrall. 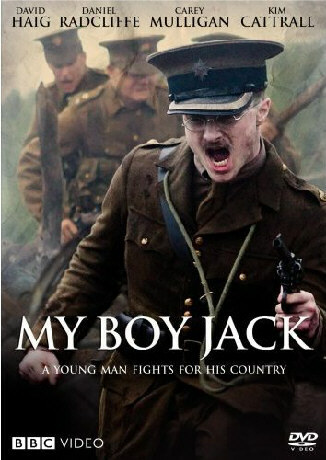 My Boy Jack will be aired on PBS in 2008 and released on DVD in the U.S. in April 2008. It helps to know something about the early years of World War One when watching My Boy Jack. Rudyard Kipling seems to be applying a great deal of pressure on his son to join up. But Jack seems just as eager to enlist and experience the great adventure of war as his friends are. Historically this is accurate, but in Jack's case it is also portrayed as a chance to get out of the house and away from his father with whom he has a complex relationship as the sole son of a famously patriotic father. With nearly a century of hindsight it would appear that trying to get a military commission is the same as trying to get a death sentence, but this is an anachronistic view. Many in command expected to war to be short one. Back in 1914 no one could reasonably foresee the extremely high casualty rates of the months and years ahead. The following are thanked for their contributions to this issue of the Trip-Wire: The many of you who sent the news about Russell Coffey, Diane Rooney, Tony Langley, Christina Holstein, Tony Noyes, Andy Melomet, Kimball Worcester. Lt. Col. Elton Johnson, who is regularly deployed to Iraq, sent the rifle image. Until next month, your editor, Mike Hanlon.